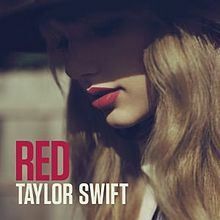 In Taylor Swift’s own words, this CD is about the red relationships in life. She is talking about “…..the ones that went from 0-100mph and then hit a wall and exploded”. While every listener can relate to this, devoting a whole CD of 16 songs to the same subject is not only a daunting undertaking, its’ a questionable one because of the risk of listeners losing interest . Some of these songs are beautiful. Taylor has a wonderful sweet voice that people love to listen to and her writing as well as her talent as a musician is superb; but devoting 16 songs to the intricacies of red relationships and nothing else produces a CD that is not only repetitive but one which also detracts from her talent as a songwriter and a musician. None of these songs have that big production sound found in Love Story, Sparks Fly or You Belong with Me. These songs have that same story telling element but lack the big production, orchestration sound she is so famous for. Perhaps that is because this is a very personal album, about her feelings and her relationships and there is nothing wrong with that but some of us love that big production, back up sound that usually accompanies her songs. Possibly mingling that sound with her story telling as she has done in the past on a few of these songs and leaving the others the way they are would have made a better mix and a more interesting CD. There are some good songs on this CD. Particularly noteworthy is the song Red. Swift describes feelings and thoughts that anyone who has been in a relationship will recognize. Another very well done song is The Last Time featuring Gary Lightbody of Snow Patrol. This song is a beautiful duet with haunting overtones that make listening to it a real pleasure. I Almost Do is another song that anyone who has had a breakup can relate to. Begin Again strikes a familiar chord with anyone who breaks up and starts over with a new person. State of Grace and Holy Ground are very pretty songs. They have that classic Swift sound. The song Stay Stay Stay about working through problems is cute and will make you smile. Another issue with the CD is there is no country feel or sound to any of these songs. As sweet and enjoyable as Swift is and as much as we love her, perhaps her next CD should focus more on songs of a country nature. Swift has the talent, she is quite capable. Here’s hoping that she turns in the country direction. She could be even more phenomenal than she is now.